I was part of Global Brigades Africa’s medical team as their “international doctor.” Along with two local Ghanaian physicians, and two sets of 20 medical students from England we provided the inaugural medical brigades, each of which took eight days, to two communities, Srafa Aboano and Ekumfi Ekotsi in the Central Region near Cape Coast, Ghana. On average our medical brigade team saw 250-300 people daily, many in family groups with several children, being supported by a local school teacher/translator and two students. Both clinics were held in schoolhouses which we made work for a triage room where temperatures and blood pressures were taken and health histories were recorded. My two fellow doctors and I met with patients in an adjoining room, and there was an education tent nearby where people could receive public health support. We also had a pharmacy on-site so people could pick up antibiotics and other supplies and receive information about how to take any medicines that were prescribed. We treated many people for parasites and malaria, some high blood pressure and the very common “waist pain” which we call “low back pain” here. After the four days of clinics, we had a “Public Health Day” that included education about water purification, which is my son’s focus with his work in both Honduras and Ghana, Malaria prevention, and physical therapy instruction about proper lifting plus stretching for low back pains. To me, this was a really important day with the idea that prevention (my career focus) and learning how to care for our body are the keys to really helping people, be it here or in Africa. Being able to bring my decades of experience in integrative healthcare to people who are in such great need was a truly great and deeply meaningful experience for me. 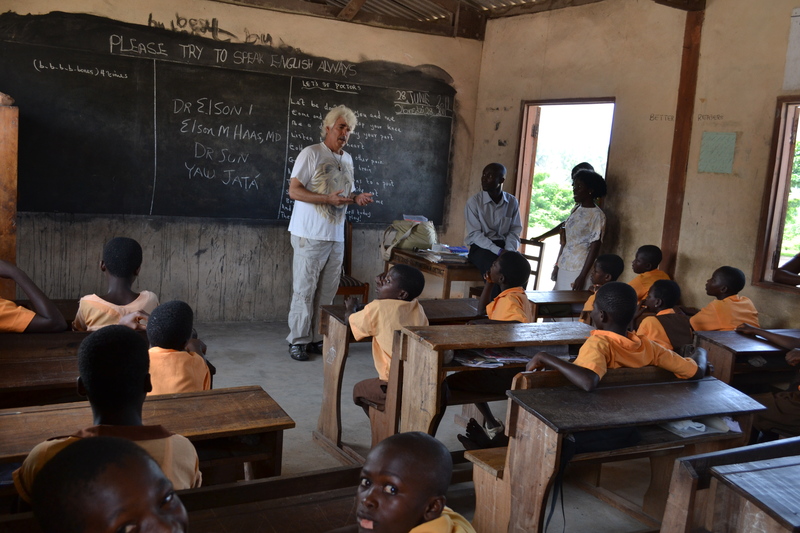 In fact, this experience was so life-changing that, in some ways, it felt like a new life here in Ghana. The people of Ghana made this trip quite special. Although they have very little in many ways compared to Westerners, their spirits were strong and their joy of life was active. They love to dance and play music, which they on our opening/welcoming ceremony day and our final day of farewell and public health education day. This area of Ghana is also very beautiful- it was quite green and lush with the tropics. Our summer is their winter and the “rainy” season, where there is an abundance of fresh pineapple, mango and bananas. They also grow a lot of corn (it’s kind of chewy) that they use for many of their local dishes. What was also special for me is that I was able to work with my son and my daughter, Ishara, and her boyfriend Max, who came over for the final three weeks on my journey. The biggest challenge was to meet and treat people so quickly and the translation to communicate clearly (most Ghanaians speak Fante or Twi), yet it seemed to work quite smoothly overall. I arranged to join my son and Global Brigades for their first two medical brigades in Cape Coast area of Ghana in Western Africa. Although there are many long routes, I prefer the simplest when possible, so I chose to fly United from SF to DC and then nonstop into Accra, Ghana, on an overnight flight, arriving in mid afternoon on Father¹s Day to see my #1 son, Orion, and his cohorts for dinner and a good night sleep near the Atlantic Ocean. Helping people in need in other parts of our wonderful world can be very rewarding, and especially to use my life-long skills as a physician for hundreds of people in Ghana and teaching the 40 plus medical students from England who joined the brigades is an experience that I will never forget and one which I will repeat in upcoming years. It¹s a fun, inspiring and gratifying way to see other parts of the world and to meet people from other cultures and get to more them much more than being a simple tourist.